Zimbra Collaboration Server Network Edition with Zimbra Mobile enabled integrates natively over-the-air with the Mail, Contact and Calendar applications on any Apple iPhone, iPod Touch or iPad. By using the ActiveSync protocol no additional download is required, only that Wi-Fi or a wireless data plan is enabled. 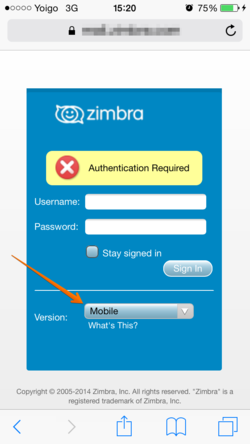 After a simple configuration step users can work virtually anywhere with their Zimbra account on the go. For more information about ActiveSync, go to http://en.wikipedia.org/wiki/ActiveSync. 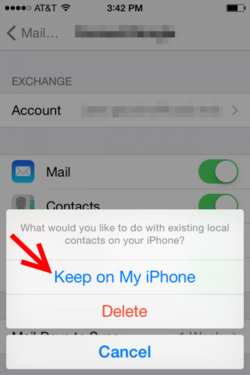 Important: Performing the following steps can delete all of the existing contacts on your iPhone. This is a common problem for iPhone users when creating a new ActiveSync account. You should ensure that you have backed up all of your contacts before proceeding. 1. 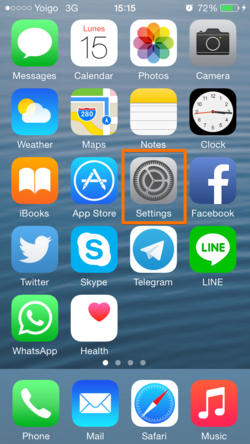 On your iPhone Home screen, tap the Settings icon (the Gears icon). 4. Enter your account information. Description. This is a descritpion for yourself, you can write the name that you prefer. *Note: Domain. If iOS ask for a domain, we need to leave the field blank Click Next. 5. 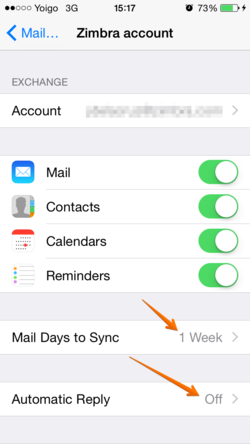 Select to synchronize Mail, Contacts, and/or Calendars by setting the sliders to On. 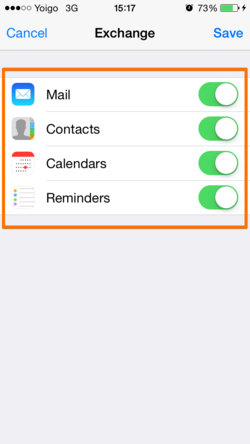 If you already have Contacts, a screen displays asking if you want to keep your current contacts on your iPhone. If you select to Keep on My iPhone, you may see duplicate entries of your contacts. 6. Click Save. 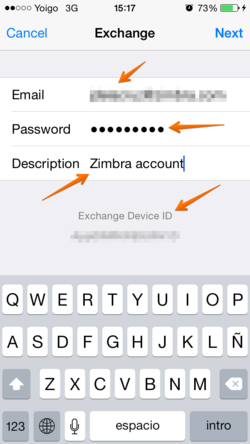 Your Zimbra Mobile account is now set up and synchronizes. You can now edit your global or account-specific settings as described in the next section, Changing Your Account Settings. Once you have successfully set up your account, you should begin to see mail folders, contacts, and your calendar(s) appear on your device. When the synchronization completes, you can edit your global or account-specific settings. In Settings > Mail, Contacts, Calendars you can set global or account-specific usability controls for your email account(s), including setting the number of messages to show, how many lines of an email to preview, font size, how often to sync, and more. Note: When you make a global setting, all your email accounts are affected. 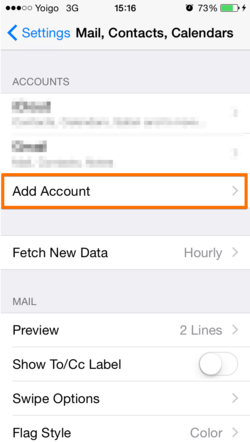 When you make an account-specific setting, only the selected email account is affected. Select your Zimbra Account and then select Account Info to adjust whether you want any of the syncing options changed, how many days of email and which folders you want synced. 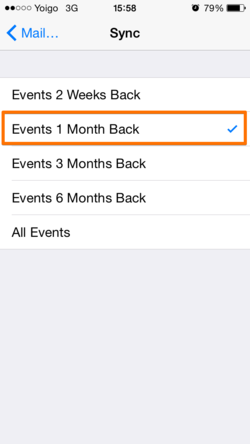 Important: If you have a large Calendar, you may have some issues if syncing more than 200 appointments. Important: If you select No Limit and you have a large amount of email, you may have some issues syncing. All devices with an HTML-compatible browser can access Zimbra email, contacts, calendar, and briefcase using the Zimbra Mobile Web Client. If you have Zimbra Collaboration 8.x or above, you can use the new Touch Client, you only need to have a License 1.2 for your server, and in you mobile type the URL of your Zimbra Server. You can read your email on the iPhone just like you would with a desktop email client by setting it up for IMAP or POP3 access. This option is available to both free Open Source users and paying Network Edition users. Note: This method only syncs email messages. 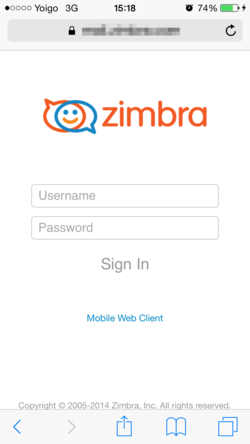 To access your Zimbra contacts and calendars, use either Zimbra Mobile Web client in the Safari browser or upgrade to Zimbra Network Edition. 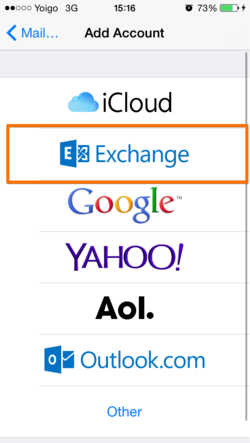 Under Mail settings, select "Add Account..."
Select "IMAP", "POP3", or "Exchange"
Provide "Host Name", "User Name", and "Password" in the "Incoming Mail Server" section. The iPhone will automatically detect IMAP over SSL if your server requires it. If your server requires a non-default TCP port specification, use the hostname:port format in the "Host Name" field. SSL settings can be adjusted later under the "Advanced" section in the mail account settings. In the "Outgoing Mail Server (SMTP)" section, provide settings for "Host Name", "User Name" and "Password". As with the incoming mail server, the "Host Name" setting accepts the hostname:port format if the outgoing mail server uses a non-default TCP port. 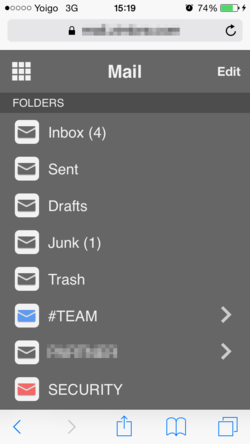 Sub-Folders: Setting the IMAP Path Prefix to "INBOX" allows for the browsing of folders child folders of "Inbox", but peer folders such as Sent, Drafts, Trash, and Junk folders are not displayed. 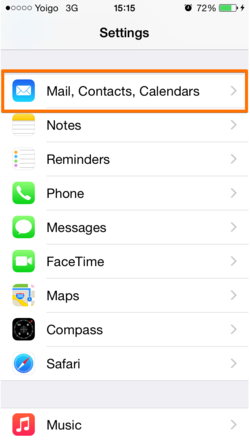 It is possible to sync iPhone contacts and calendar using Connector for iSync (Apple) or Connector for Outlook (Windows) or on Linux via iTunes. These options are unsupported by Zimbra and we recommend using Zimbra Mobile instead. The SSL certificate for an Exchange Active Sync server must have as its primary name the name by which the iPhone clients will address the server. This becomes important in situations where the Zimbra server is being run in a split-horizon DNS environment, because the name by which you address the EAS server must resolve to the same (public) IP address, no matter where you are; this may mean that users who have no name for their Zimbra server which behaves this way will need to add one, and such users will need to make sure that name is primary when they rebuild their cert. You may wish for the Zimbra server to send you a text message when you receive a new e-mail. 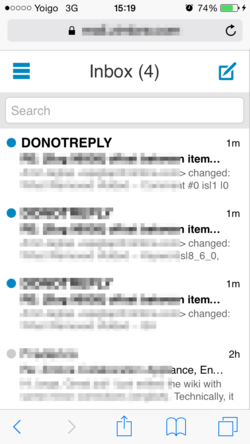 Check "Enable address for new mail notifications"
Now the server will text message you when you receive a new message. Text messaging rates may apply.